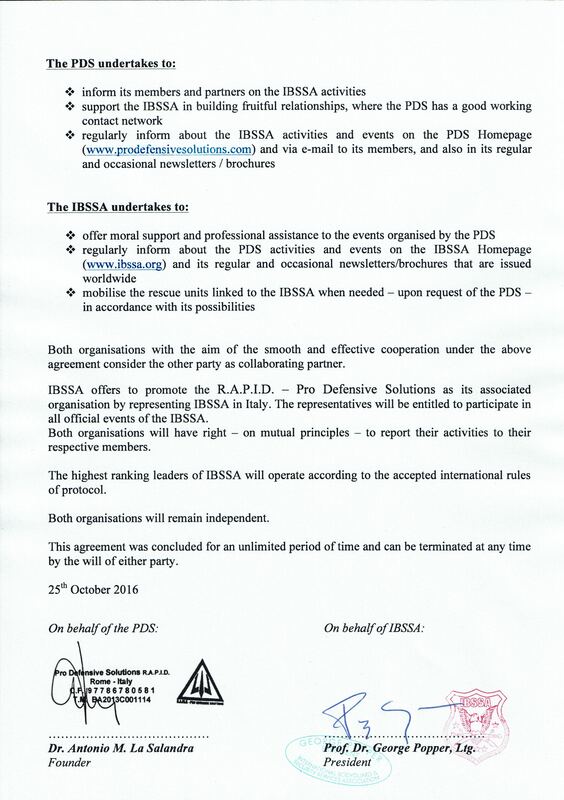 In October 2016, in order to increase the efficiency and impact of further actions, IBSSA agreed on cooperating in the future with R.A.P.I.D. - Pro Defensive Solutions (Italy). 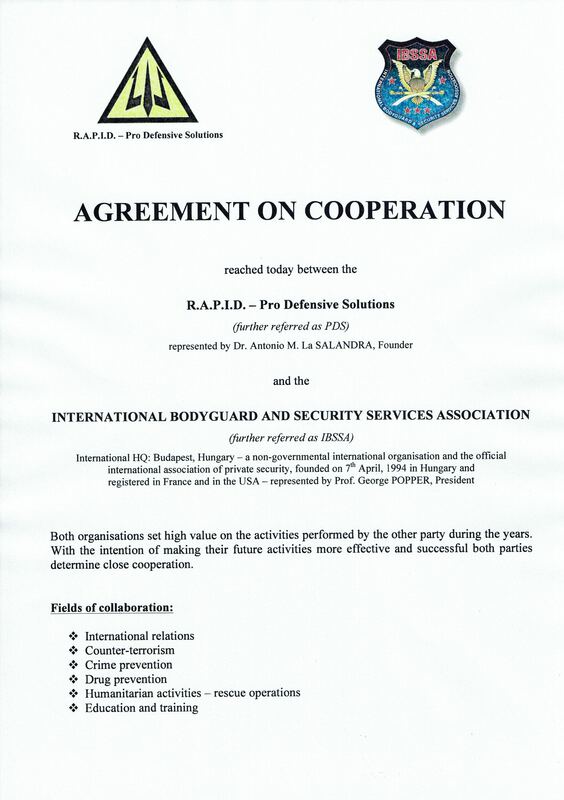 Dr. Antonio M. La Salandra - Honorary Member of IBSSA founded PRO DEFENSIVE SOLUTIONS (TM) asd in 2004, which provides training programs for security, law enforcement and military professionals as well as civilians. They offer advanced trainings and courses, with R.A.P.I.D. Methodology (TM), for a wide range of missions, terrain and tactical situations. They can train both; individuals and units applying their knowledge and experience to support stated objectives. The instructors team is a selected group of experts with a long term experience in law enforcement and military units. This method allows a short time to acquire techniques and procedures to be used when carrying out high-risk professions (security operators, operators of the police, army, etc. ..). RAPID System, includes sessions of intensive training under conditions of stress induced in simulated reality. Are not taught only the theoretical or practical, but also operational procedures performed in real environments in order to allow the operator to work immediately as it would in the real professional. P.D.S. provides also bodyguard and private soldiers for each kind of work in each part of the world.